And why not? He knows where all the best parties are. 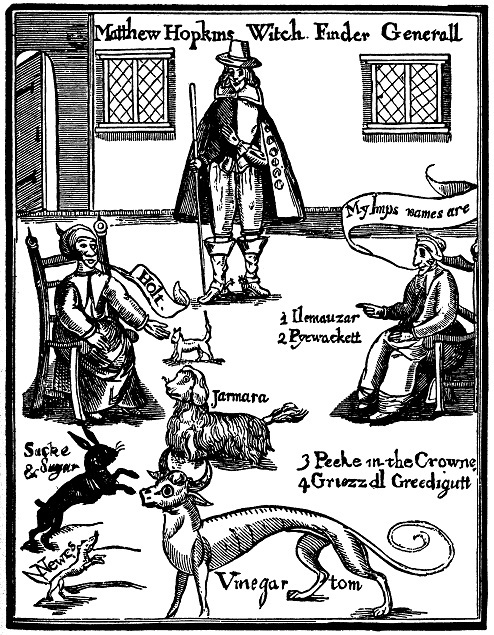 If you need to name some “imps,” you could do worse than Pyewacket, Grizzel Greedigutt, Sack & Sugar, or Vinegar Tom. Come to think of it, these domestic familiars look like kissing cousins to the animals in that bestiary I linked to a few weeks ago. Whoa–I just realized that my blog was set at Greenwich Mean Time, not L.A. time, so my apologies if you thought I was posting from The Future! I’ve corrected it now, I think. I had a little male cat who looked just like this Vinegar Tom–minus the horns, of course. I should have called him that! Yup. And there’s now a wikipedia article just on the name pyewacket (though I don’t know if that imdb is copying wiki or it copied the imdb or they were both written by the same person).